Most teachers at Auburn South Primary School have begun to harness the power of mindfulness to improve wellbeing and learning outcomes for themselves and their students. The following are notes on Mindfulness that were taken from Dr Craig Hassed’s lecture, Mindful Learning on 14 May 2015. 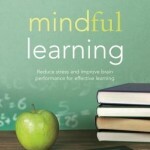 Excerpts from Dr Hassed & Dr Richard Chambers’ book, ‘Mindful Learning’ are also included. Throughout each of these activities and in order for students to be at their best, we are demanding and encouraging students to be functioning and concentrating at an extremely high level. Some teachers will only have students for 50 or so minutes each week; making the most of this learning time is critical. It’s exhausting just reading the list above and as teachers (and parents) we need to appreciate how challenging it can be to be constantly shifting your attention from one task to another. Along with attention control, what are the other benefits of practicing mindfulness? Details of the research that underpins these reported benefits and applications can be accessed in greater detail in Dr Hassed and Dr Chambers’ book, Mindful Learning (2014).